1. Preheat the oven to 190ºC, gas mark 5. Finely grate the zest of 2 oranges into a dish. Add the juice of 2½ oranges, the mustard and oil. Add the chicken, mix and leave to marinate. 2. 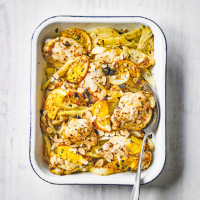 Halve the fennel bulbs, discard the core, then slice into wedges, about 1cm thick and place in a large, deep baking tray. Pour over the marinade and the chicken. Slice the remaining orange into segments 0.5cm thick then place on top of the chicken, sprinkle over the olives and the thyme, then season. 3. Roast for 30-35 minutes until the chicken is cooked through with no pink meat and the fennel is soft. Put aside the chicken, fennel, olives and orange. Boil the cooking juices in the tin, stirring for 3-4 minutes until thickened. Pour over the chicken and sprinkle with the almonds. Serve immediately with vegetables and couscous. Cook’s tip Try using firm white fish fillets in place of the chicken. Monkfish, haddock or pollock would all work well. 1 of your 5 a day; a source of fibre.